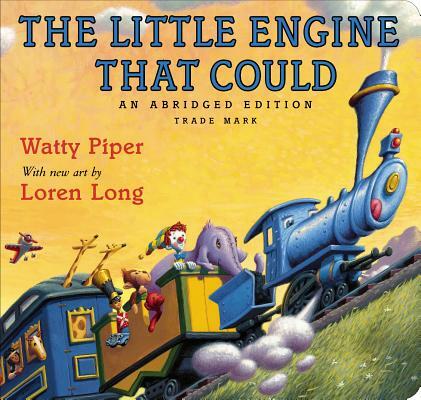 THE LITTLE ENGINE IS NOW AVAILABLE AS AN ABRIDGED EDITION FOR LITTLE HANDS—THE ALL-TIME CLASSIC, RE-ILLUSTRATED BY THE CREATOR OF OTIS! Now the #1 New York Times bestselling edition re-illustrated by Loren Long, the creator of the Otis series, is ready for the youngest readers to hop on board! I think I can—I think I can—I think I can. . . .
As creator of the immensely popular Otis the Tractor series, Loren Long has putt puff puttedy chuffed his way all over the bestseller lists with such titles as Otis, Otis and the Tornado, Otis and the Puppy, An Otis Christmas, and Otis and the Scarecrow. He is also the author/illustrator of Drummer Boy, and has illustrated bestselling books by Randall de Sève (Toy Boat), Madonna (Mr. Peabody’s Apples), President Barack Obama (Of Thee I Sing) and Watty Piper (The Little Engine that Could). A graduate of the American Academy of Art in Chicago, Loren lives in Ohio with his wife, Tracy, and their two sons.